"Their rescuer was Mr. Benjamin Chaplin...who was sailing a converted trawler, Cleone, accompanied by the owner"
Benjamin William Chaplin was a professional yacht master, skipper and larger than life character. He was born in Brightlingsea, Essex in 1896, the eldest of four children. His father, also Benjamin Chaplin (1872 – 1918), was a Master mariner and was the sailing master of the Marquis of Ailsa’s ‘Bloodhound’, as well as serving aboard Sir Thomas Lipton’s ‘Shamrock II’ and the Herreshoff designed ‘Navahoe’ in the early 1900’s. Around 1910 the family moved to Itchen, Southampton. Benjamin Chaplin senior died during Patrol Service in 1918. Chaplin was to follow in his fathers’ footsteps serving in the merchant navy until his discharge in 1920. A family story holds that he was shot in the leg running alcohol to America during Prohibition, which is given some support by a surviving shipping card dated 23 November 1923 linking him to the S. S. ‘Newton Bay’, whose owner during this period was a known ‘Rum Runner’. 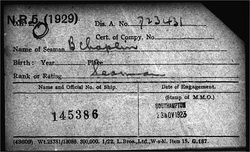 In 1924 Chaplin returned from New York on the Cunard passenger liner ‘Andania’ and his papers show he was a seaman living in Woolston, Southampton at this time. By 1934 Chaplin was a qualified yacht master living in Netley Abbey, near Southampton and served as a parish councillor for Hound and Netley Abbey from 1933/'34 to 1937/'38. “When an angler came ashore at Hamble, Hampshire, yesterday, he showed Captain Benjamin Chaplin, vice-commodore of the Hamble Angling and Cruising Club, a 25lb. tope he had caught in Southampton Water. “I bet you 5s. you can’t do better than that,” he challenged. Captain Chaplin took on the bet, and later came ashore with a 40lb. tope, a 45lb. tope, and a 28lb. conger eel, all which he had caught within 20 minutes off Ryde Pier, Isle of Wight.” (Portsmouth Evening News, 27 June 1938). Certainly, by the late 1930’s Chaplin was employed by Regnart to skipper his converted ketch, ‘Cleone’. 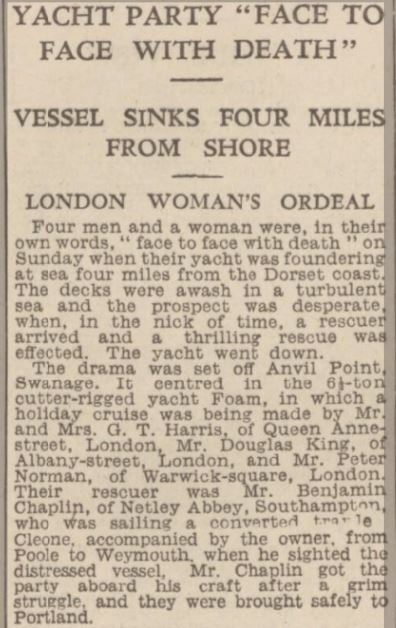 She is recorded off the south coast on a number of occasions as well as attending events at Cowes in 1938 and 1939. One cruise in particular stands out. 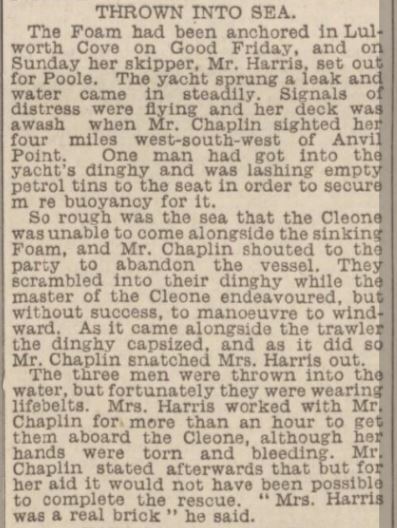 In April 1938 both men were aboard ‘Cleone’ mid passage from Poole to Weymouth, when Chaplin sighted a sinking yacht, the ‘Foam’, and quickly attempted to bring the ‘Cleone’ alongside to affect a rescue in heavy seas. The episode was widely reported in the press. 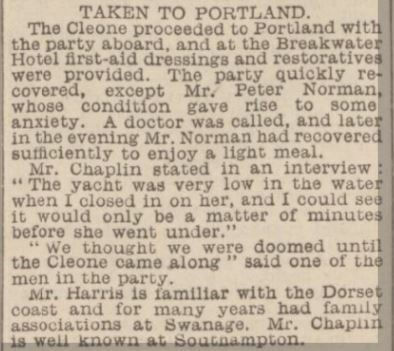 Given Chaplin’s involvement with ‘Cleone’, it’s possible that Regnart may also have asked him to skipper ‘Seran’ through the French canals to the Mediterranean in the mid to late 1930’s, although no documentary evidence has been found to date to support this. In 1939 Regnart and Chaplin commissioned and subsequently co-owned the 'Jolie Brise', a traditional Essex fishing smack, built by C. Kidby & Son, Brightlingsea. The choice of vessel and yard is interesting given Chaplin's Essex roots. Their shared interests and shared ownership of the ‘Jolie Brise’ hint at a friendship beyond that of a purely working relationship. In his later years Chaplin grew a large beard in which, legend has it, he caught a budgie that landed on him while at sea! He had retired by the 1950's and ran a pub in Cowes on the Isle of Wight. Chaplin died in 1959.